From Laurie White's Flickr photostream. 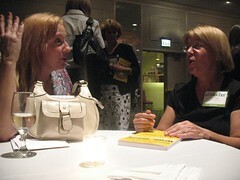 This is Catherine Morgan (fellow CE) and I having some deep discussion on Thursday night. BTW, I completely LOVE Laurie and Catherine. Bring a rollerbag to carry items to/from/around the conference. Living like a turtle with my life on my back for 3 days was a pain in the shoulder. Leave the camera at home. I took few photos; it was extra weight and worry having it. MAX: 2 pairs of jeans and 4 tshirts. One pair of supportive shoes. I am not the fashion plate person here. And I need space for the swag! Color my hair (and maybe whiten my teeth and get my eyebrows done) a week before the conference. I might not be a fashion plate, but I can still look good. Pack earplugs for more than just sleeping. Or investigate sound-cancelling headphones. Something to kill some of the background noise but let me hear the people. Set reminders on my phone for sessions I don't want to miss. Then set it to vibrate. In my pocket. I won't miss anything important while I'm gabbing my face off and sipping espresso at the internet cafe. Carry a small notebook in my hand (with pen this time) and use it. Note down when/where you meet people and get their cards. Copy down links in sessions. Remember that I'll be tired and dehydrated and do whatever I can to compensate.